to enable Android on TV outside of Google's control. On January 5th, just a few days before the opening of the 2012 International Consumer Electronics Show, Google announced a new set of partners for the development of Google-TV 2.0. For integration directly into TVs, Google has added LG, Samsung, and Vizio to 1st generation partner Sony. 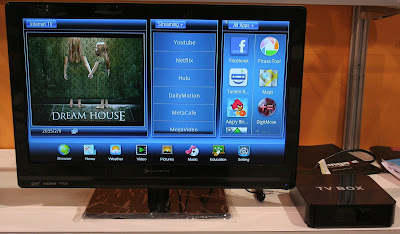 Intel has dropped out of the smart-TV market, and is being replaced in Google-TV by chipsets from Marvell and MediaTek. 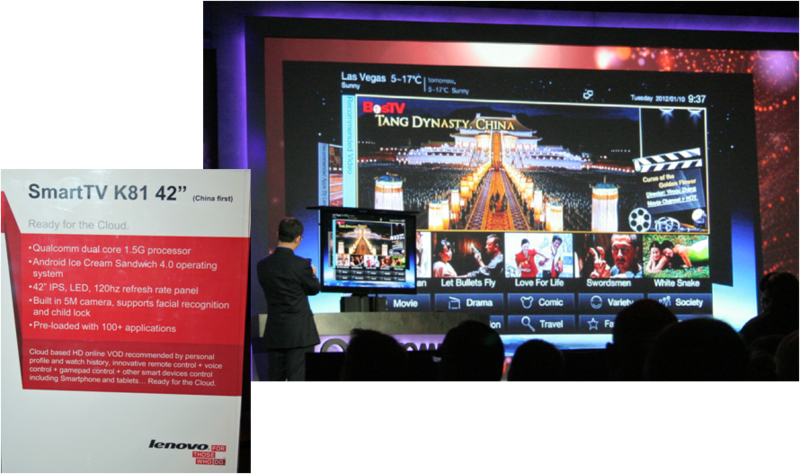 LG has developed their own proprietary ARM-based L9 chipset for Google-TV. 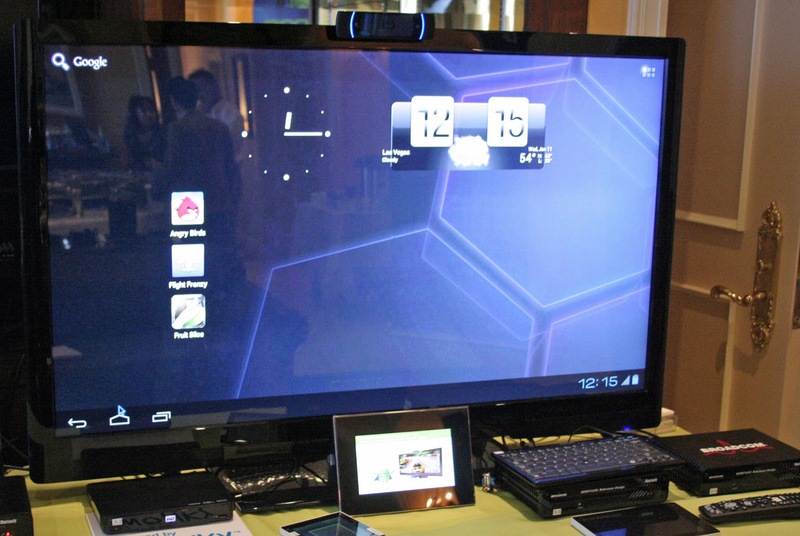 Google released their TV add-ons to the Android SDK to developers in October 2011, but that has not stopped a number of manufacturers from developing their own version of Android for TV from one of the open-source smartphone/tablet versions of the OS. An entire alternate ecosystem is paralleling Google's efforts, and in some cases has designs on using Android to keep Google from going "over-the-top". 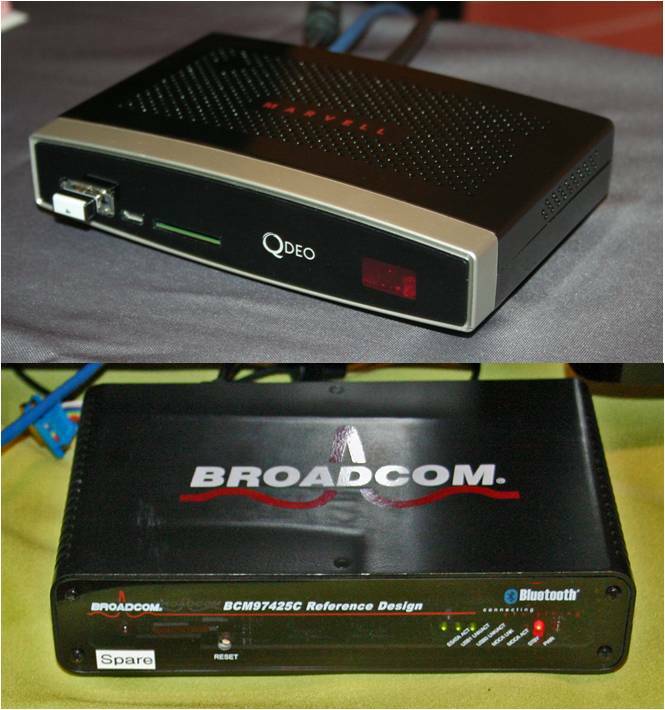 MIPS demonstrated the Broadcom 7425 STB Reference Design in their suite at CES. Broadcom has developed the MIPS-based BCM7425, which the company describes as a "Dual HD Transcoding MoCA 2.0 Gateway SoC". The day before Google's CES announcement, Broadcom announced a joint-development with the Myriad Group, a Swiss company, to port Myriad’s Alien Vue technology to their platform. Myriad is a founding member of the Android Open Handset Alliance, but their Alien Dalvik is designed to allow Android applications to run on non-Android devices. The company demonstrated the ability to run Android apps on Apple iOS devices at the 2011 CTIA Enterprise and Applications Show in San Diego. According to Olivier Bartholot, VP of Business Development at Myriad, service providers such as cable TV Multi System Operators (MSOs) in Europe, Asia and the U.S. are interested in Alien Vue because it allows them to provide Android applications to their subscribers without opening the door directly to Google for Over-The-Top (OTT) delivery of content. or Google-TV apps, enabling cable companies to keep control and manage their services. Bartholot says that Myriad delivers more than just software for running apps, providing a complete end-to-end solution for MSOs that includes billing, an app store, and curation of apps, basically giving the service provider complete control against "to respond to the threat of new over-the-top content distribution". 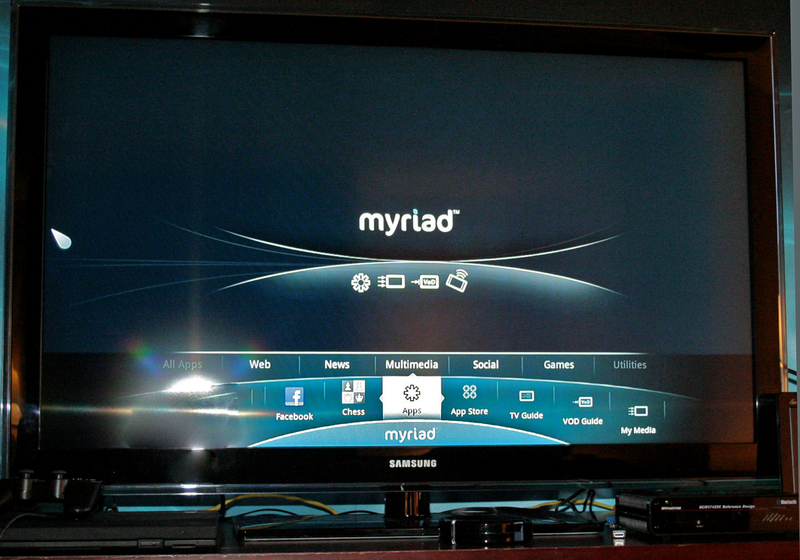 Myriad VUE even supports apps that are designed to run on Google-TV. 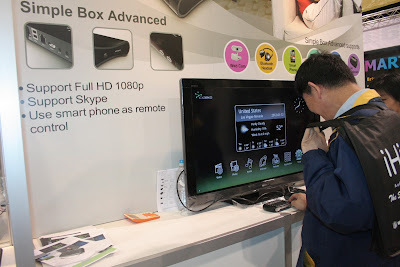 There were a number of other manufacturers also showing Android-TVs or Set-Top Boxes (STBs). In the CES Opening Keynote address, Qualcomm featured their collaboration with Lenovo to develop a Snapdragon-based Android-TV for the Chinese market. Lenovo has also developed their own application store, to circumvent the limitation of developing a non-compliant Android device using Ice Cream Sandwich. Lenovo developed this Android-based Smart TV, based on Qualcomm's Snapdragon processor, for the Chinese market. Taiwanese manufacturer Cideko showed their "Simple Box" media player, which they claims provides access to the Android Market. It is ironic that the open nature of the Android operating system is now being exploited in TV applications, by manufacturers and service providers who wish to create obstacles to Google's efforts to proliferate their own platform for the living room.